Edu-speak. 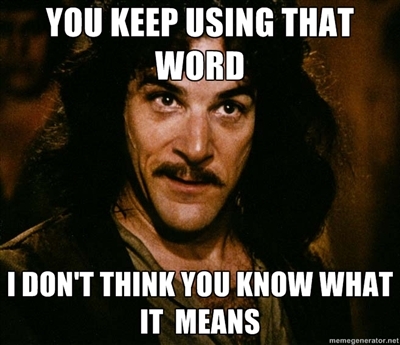 In 2013, Education Week published an article titled "Tackling Edu-Speak." It's focus on a glossary designed to help the weary, the wary, and the just plain baffled navigate the currents of jargon in education. It is The Glossary of Education Reform. It's like the OED (Oxford English Dictionary) of educational terms, jargon, and babblespeak. It should become your new best friend. Follow the link and bookmark it. Now. I'll wait. 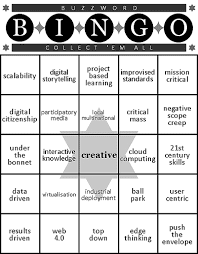 What got me to thinking about educational jargon is the discussion, mmm, occasionally argument, over STEM vs. STEAM. Then there is the on-going yawner of tired controversy over Common Core. Of course, we talk about student engagement, student success, and student achievement and there are long lists of words, like stringers of bait, attached to each of those terms. What is so fascinating is how quickly we take that bait and leap to the next idea. Our appetites are often satiated for a while, but only for a while. I'll stop trying to make that analogy work, but you get the idea. Writing in 2015, Liz Wellen wrote for The Hechinger Report on this very topic of "edu-speak" (and introduced me to the term "argle bargle"!). 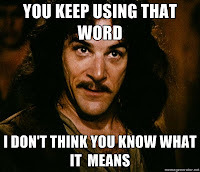 Don’t get me started on overused phrases like “grit” and “rigor,” along with “21st century skills” or “researched-based programs” that educate “the whole child.” As opposed to only half of a child? And what of charter-school movement lingo, replete with “restorative practices” and “growth mindsets”? I appreciate and applaud Ms. Wellen's frustration and mission to eradicate jargon and try to insist on returning to saying what we mean and meaning what we say. I know educators often adopt language they don't really understand because they've read it or they've heard a boss use it. I know educators often use language they hope will confuse parents or others for a variety of reasons including that they don't really know what else to say so they hope using a litany of edu-babble will help move things along. What can happen is that people break into groups to have conversations about stuff they don't understand and everyone pretends to know what it means so they contribute superficial observations or simply agree with the person who is talking the most because maybe he actually knows what he's talking about and no one wants to look stupid. Great model for the kids, people. Now I don't want to be the jargon police and not just because it's a thankless and endless job. But I do think that countermanding or, as Greg Garner wrote, undoing edu-speak is and will be difficult. In fact, his piece on trying to unload jargon is littered with jargon, which is no surprise given how embedded it can become. And not just because we are wont to incorporate the language of others into our own lexicon and often without vetting it, sifting it, or otherwise checking to see if it makes sense. An aside: some years ago I noticed how quickly certain people picked up the current jargon. "Going forward" was the phrase du jour. It hadn't been a part of conversation and then everyone was using. Just because I'm stubborn about some things (okay, a lot of things) I chose not to use it. In fact, every time there was the possibility of using the phrase "going forward," I used something else. Then I decided to try an experiment. I used the word "hiccup" to describe what was, I hoped, an anomaly in a process. I noticed some interesting non-verbals when I used that word. It was weird. It was like predators sniffing the air to figure out if this was something on which they should pounce or if it wasn't worth their time. In my head, my little editor guy and I snickered. "Oh yea, this will be fun," we chortled. In another meeting I found an opportunity to use "hiccup." It wasn't contrived so the word fit the situation. Again, the non-verbal check. A few days later I used it again and within a couple of days after that, people were talking about hiccups. I stopped using it immediately. That fad didn't last long. After all, no one outside of our little community was using it but the experiment and experience left a profound impact on me. I doubt we can eradicate edu-speak any time soon. There is too much government in our education and governmentese seems designed to obfuscate and frustrate any chance of anyone knowing what anyone is really saying. Ever. But I do think we can make inroads. Each time we're in a meeting in which someone is yammering and using a string of education-sounding words, do a quick look-up in the The Glossary of Education Reform to do a bit of fact-checking. Or just ask the person to use plain English. And when we're in workshops or faculty meetings or professional development and we find our eyes glazing over because of the use of language we really don't understand, let's be brave enough to raise our hands and ask for an explanation. 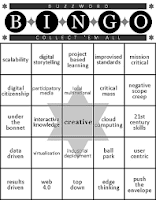 Or just create a bunch of buzzword bingo cards and play the game with your colleagues, then hand the cards to the speaker/presenter on your way out.